If they fall in a foreign land, they are brought home to the Trenton Air base. I was born on that air base. Today, I listened to the serviceman who, for many years, had the job of escorting the hearse and the family members from that base, along a 170 k stretch of highway that has 50 bridges. He said the families were grieving as expected, but each time they passed under a bridge, they smiled and waved and commented on the show of support for their loss and the ultimate sacrifice paid. Not one hero passes along this highway alone! Today, we give thanks to all the brave men and women who have risked their lives for our freedom. We bow our heads in memory for those who gave their very lives for our freedom. We think of the shattered lives and terrible struggles so many have suffered from the trauma of action. We are grateful and humbled by their selfless devotion to their homeland and the ideals we hold so dear. 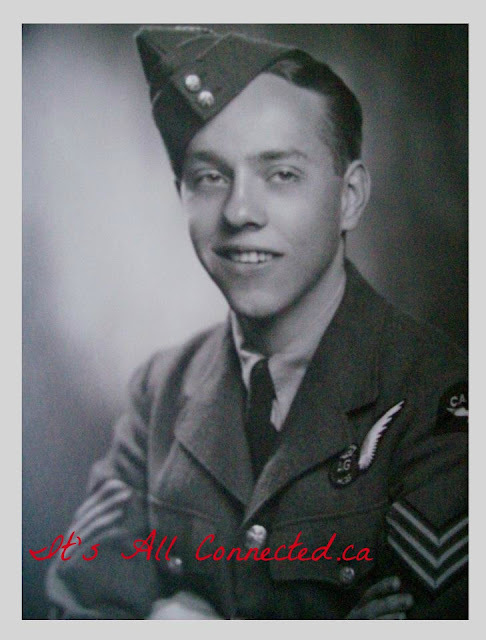 My hero joined the Royal Canadian Airforce, by special letter of permission, at age 17. He'd already lied about his age and enlisted at age 15 and was very close to being sent overseas before he was found out. By 18 he was stationed in Britain and was a tailgunner on Lancaster bombers. He knew full well that there was no escape for tailgunners, should the plane be shot down. When the war in Europe ended, he immediately signed up for the war in the Pacific. He was sent home on a thirty day leave and, on the 29th. day, Japan surrendered. He had done his duty and then some! Thanks, Dad. I'm so glad you did not return via the Highway Of Heroes. I'm so glad you had the courage to stand up for your beliefs and I carry on your ardent support of our service people. This press photo of my Aunt Molly, a decorated Canadian Nursing Sister, is taken in Flanders Fields. 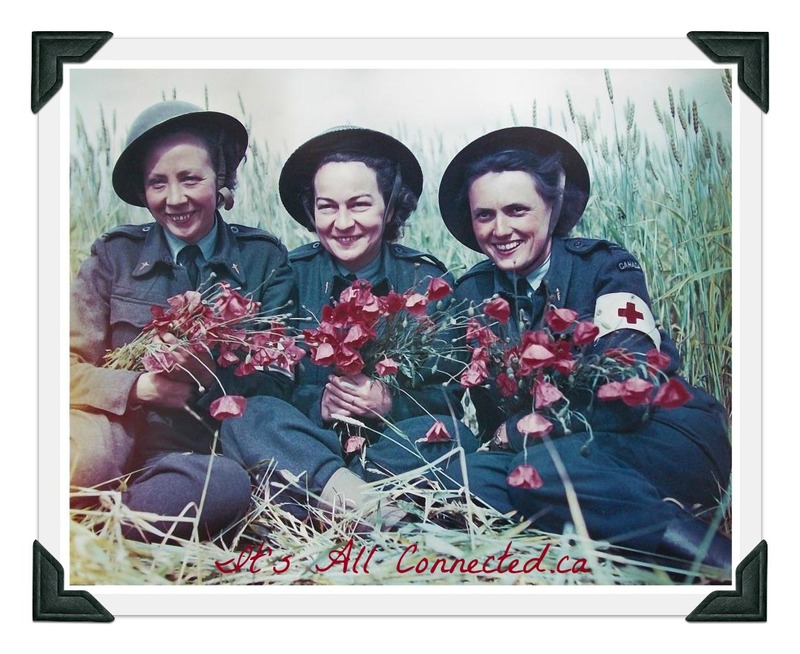 These poppies are a beautiful symbol of remembrance and hope that someday no one needs us to greet them them as they make their silent journey down our Highway Of Heroes! Thanks so much Maureen. A beautiful tribute. Oh Maureen now you've done it. I've got to go get a tissue. Sniff. What a beautiful tribute to the fallen. I wish for a world were war is a distant memory. What a story! Love the photos of the ladies and your dad. My uncle was a private in the Forestry corp that was stationed in the highlands of Scotland...unfortunately he didn't make it home and was killed right before the war ended. I think of him often and wonder what kind of life he would have had had he survived. That photo of Aunt Molly is wonderful. May we never forget those who have given all. Another beautifully written post Maureen. Great photos (which lady is your Aunt - I'm trying to work out which one looks a bit like you ! )and what a wonderful way for a country to honour fallen heroes. 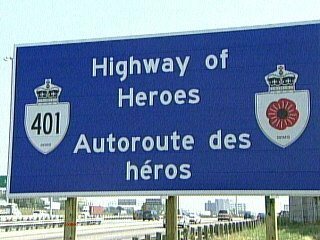 What a wonderful post on the Highway of Heroes. I had never heard of it. Your words today were so very touching. How lucky you are to have had such courageous and giving role models. Thank you for sharing such an enriching story. PS: You look a lot like your dad! Maureen -- wonderful wonderful post. And such great shots of your Mum and Dad. It is important to remember, always. This is a beautiful post. I love your highway of heroes. I love looking at the pictures of the soldiers in those days so handsome and young and ready to do their countries proud. Lest we forget! What a nice post, love the pictures, I didnt know you were born on an air base, hmmm interesting. Always love reading your posts. Maureen, this is an awesome post! the highway is amazing! and that photo of the ladies fabulous! And your Dad was like a lot of young men of that time and like my uncles...fibbing about their ages and signing up early. :) Thank you for sharing. xoxo P.S. thanks for the heads up on my broken link. I fixed it. I made a point of watching the ceremony in Ottawa yesterday and as usual had tears running the whole time. My husband works as a teacher for the students whose parents have been serving in Afghanistan and yet once again we are seeing a group leave to head off into the unknown. Touching post Maureen. What a touching post, Maureen. I am struck by the photo of your dad. Amazing to think that he is the man who scooped ice cream for me on far too many summer afternoons when I would sneak over to the store. This post gave me goosebumps!! Love the picture of your dad and the highway of hero's story...Great post! How moving. The photos of your dad and your aunt are wonderful to see. All those people along the highway showing their support and respect are just marvelous to see. What a wonderful post Maureen! Wonderful and moving post, Maureen. It's the most poignant I've read of the Veterans Day writings because it's personal and succinct. The photo of people standing in the cold with flags says so much. Thank you. Oh gosh I loved this post Maureen! Touching and so moving! This is so beautiful. Gives real meaning to the words "A grateful nation". Loved seeing the pics of your dad and aunt. You know Maureen, my uncle was in the force. But he took voluntary retirement to be a press photographer. Heard so many stories from him...so many friends he lost, so many young comrades. Back in the Hill days, our cottage nestled beside the National Highway 14. During kargil war (between India and Pakistan) I've seen truck full of bodies come in wrapped in Indian flag. I still shudder to think of those. Salut to the real men, irrespective of which country they belong to. thank you for sharing this. I'm all crying and smiling at the same time. I spent 4 and a half years in the U.S. Air Force and wish our U.S. military were given as much respect as Canada's are. How many crazy Americans make their way up there to ruin Canada's parade like they do here? Flipping attention seekers even protest at servicemen's funerals. They have no shame.